Last week when I was catching up my deluge of emails I finally opened the email titled “Fall 2013 Courses from Stanford Online”. Flicking through the seemingly unending list of science and math courses an oddball suddenly caught my attention: “Practice Based Research in the Arts”. I clicked on the link and was surprised to find the course offered through NovoEd, a company I had never heard of. In any case, this is a course that would have been immensely helpful last year when I was scratching my head what to do for our studio class. But then the same questions linger on and continue to plague my thesis. Judging from how much I participated (or rather did not participate) in free online courses in the past year — even courses that actually had to do with what I’m studying — I doubt I will meaningfully participate in this course. A little too late for me, I guess. The nightly closures have always bothered me. However, they had always been just a minor annoyance until I made up my mind to spend more time in the ceramic studio this semester and force myself into a “consistent studio practice”. The thing is, as we all know, “you can’t rush ceramics” and this applies even to such simple things as cleaning up the studio after use. I’m sure this affects all the other MAAD studios (rushing foundry work, anyone? ), but if you rush the cleanup process you are likely to create an actual safety hazard. So today the security guards didn’t announce the closure until twenty minutes to six. I was at the wedging table doing something that turned out to take at least an hour and a half of uninterrupted time, and you can’t really see the clock from the wedging table when you are working. Cleanup takes approximately 30 minutes or more, so even if I stopped immediately I wouldn’t be able to leave the studio at six. I mean, there was a conference downstairs and judging from previous experience the building had to remain open for at least another two hours. So why rush us, especially since they were at fault for not announcing the closure earlier? By rushing us they were actually encouraging safety hazards to happen. So what is the purpose of security? Isn’t the job of security to reduce safety hazards and not cause them? I overheard that the school is trying to get grad students to use the studios at 100 McCaul more. But grad students with studio access at 205 (not us… unfortunately) have access to their studios 24/7, 365 days a year. Asking them to leave the building at 6pm on Saturdays (when they might be working on huge installations?… sorry) is going to require some getting used to, and for some students their schedules might not allow this, and — this is a crazy serious issue — since the school is specifically trying to get us to use these studios to work on materials the daily closures are actually going to, at times, cause safety hazards. So I seriously doubt this initiative will work out. Robin did her demos for handles and surface decoration today. I knew my techniques were not great, but I didn’t realize they were so off the mark. I have been finding handles so hard probably because my techniques were so wrong. So I guess I’ll need to try the new techniques. The two cone 6 pieces are ready for trimming, as well as one of the cone 04 pieces I did two days ago. Practice time, I guess. Too bad I didn’t take a few pictures today; I should have kept some records of the two demos. The past few days have been especially unproductive. My Mac’s hard drive is dying — again, but this time apparently for real. The odd thing is that while the drive is obviously dying, it has logged zero SMART errors. All the usual culprits — reallocated event count, offline uncorrectable, and UDMA CRC error count — are zero. Yet I can’t even get a short offline test to run — it always interrupts at 20% with a “Host reset”. In any case, I managed to finish a Time Machine backup, after getting a large drive and running Time Machine for three days. Then I got another smaller drive, restored the backup onto the smaller drive, and — Voilà… it did not work. Putting the boot into verbose mode showed “Waiting for DSMOS”, which is essentially just a mystery error. It turned out that Time Machine excluded /private/var and so almost 2GB of files were missing. Since the internal disk was not dead yet, I was able to copy all the missing files (plus more missing files in /Library/Caches) to the external drive. This time it finally booted — slower than before, but at least it booted. Getting the “Waiting for DSMOS” mystery solved was major frustration, especially since lots of things in MacOSX are either undocumented or, in single user mode, simple don’t work. Some things are so broken it just doesn’t make any sense: For example, I managed to corrupt the new disk’s HFS+ journal simply by remounting it read-only, then I found that fsck was not able to see there was corruption, nor was able to clear the corruption (if fsck -fy fixed all problems, then it can reset the journal, but didn’t). Clearing the journal required venturing into the recovery disk — which now takes forever since the internal disk is dying — to run the diskutil command, which in Apple’s infinite “wisdom” does not work in single user mode. If you think Apple is just neglecting the command-line interface, then you are wrong. When I first tried to install Lion onto the external drive I gave up after 5 minutes, because I could not connect to my school’s Wi-Fi network. I was able to type in my user name and password, but it was asking me for a keychain user name and password, which in recovery mode of course do not exist. The GUI was just as neglected as the command line. My skepticism of Apple products used to be solely based on their decision to not use X11 as their GUI’s foundation, but this debacle has caused me to become even more skeptical. Their recovery tools are completely neglected — not only the command-line based single user mode, but the 100% graphical Recovery Disk interface. The Mac has turned out to be even less tested than I thought. No wonder the new iPhone has problems; it’s a miracle if it didn’t. The first piece I threw has now been destroyed, after spotting two cracks on the inside this afternoon. I now have two almost-finished pieces destroyed for reclaiming, but since I have made so many more pieces this semester I still have almost half a dozen in the pipeline. I still have lots more opportunity to practice and try new stuff. And for what’s worth, it was a practice piece and I’ve already done a lot of experiments on it so it’s ok. I have no idea if anything scratched like this is still structurally sound or safe to fire, but I guess if I leave enough thickness for me to scratch it will be safe; this will be in the queue of things I’m going to try. I have also accidentally deformed the first plate I successfully threw. It looks like it’s still in one piece though, so I’ll still fire it, if not just to practice glazing. But it looks like the next practice piece is going to be another plate. That was what I saw when I dug out my old thesis proposal — the one I abandoned in favour of the one I submitted but now also abandoned — today to figure out my direction. I knew we now only have eight months, but I had forgotten that before the change we still only had nine and a half months instead of a full year. Under the new scheme we actually “only” got one and a half months less. Which sort of makes things look brighter, I suppose. And while still tentative, it now looks like my direction has firmed. I couldn’t really stay for Throwing Club today, but I managed to spend two hours after class at the studio to practice. 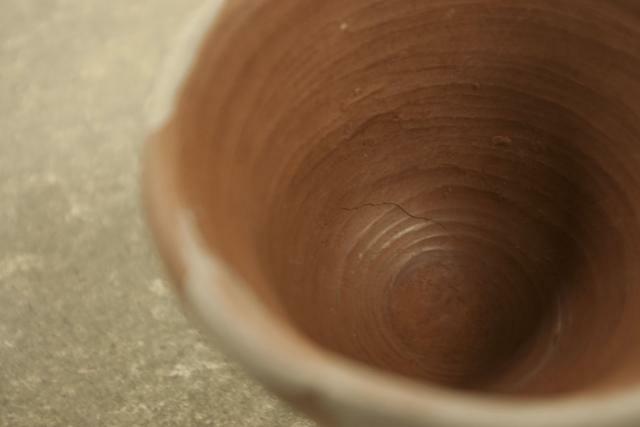 Not having thrown for four months, I almost failed to even centre the clay. 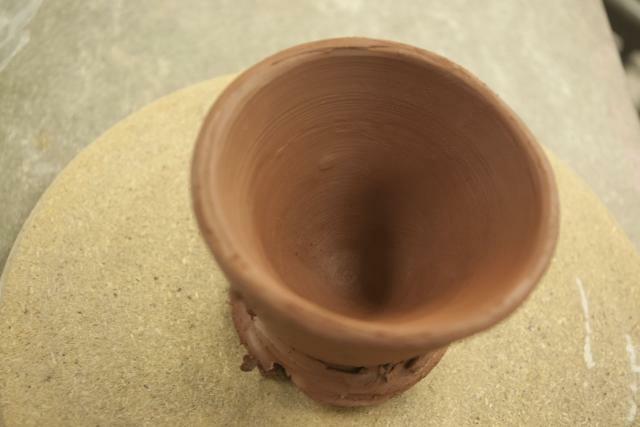 And when I tried to shape it it almost felt as if the clay had no plasticity. 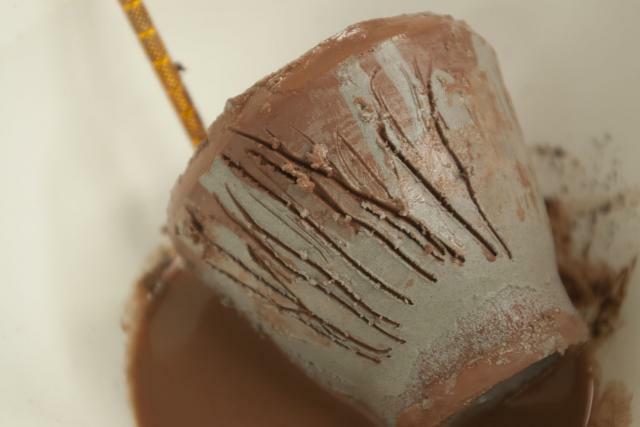 So when the first blob of clay collapsed, I grabbed my second blob and, for the sake of making something to later practice trimming on, decided to pretend to be Ayumi Horie. And I eventually managed to make something that at least looked like a small handleless cup. Indeed, after the whole exercise I felt more tired than playing three hours of badminton. But the two hours at the studio did seem to calm me down tremendously. I think I’ll have to, whenever feasible, aim for heading to the studio first thing in the morning before I tackle the other, technically much more important stuff. I had my first stab at generating some sound today. It was a total flop: Not only does it not sound like the real thing, it doesn’t in fact sound like anything that is not random noise. I need to figure out a way to make something that sounds less random. The question is how. Something has changed. Last year when I told people which program I was in most people just drew a blank: They had never heard of our program. This year people might not know a lot about our program, but they seem to have at least heard of it. Last week when I slipped into the Student Union office to ask about volunteering I was asked if I was in the undergrad program or the grad program. Today I was chatting with someone else from the SU and I was again asked which program I am in, and when I told her she called our program “the mystery program”. People still aren’t aware this is a two-year program, or why it’s a two-year program for that matter. But our program has graduated from being the unknown program to “the mystery program”: That is an improvement. I finally figured out what’s wrong with my setup: I need to use the copy of python that comes with Paraview, which is a 64-bit version, and not the copy that came with MacOSX, which is a 32-bit version. I kept running out of memory not because the arrays were so huge, but simply because 32-bit python can’t handle these arrays. So I have converted everything to .npy files and I’m now ready to start try synthesizing some sounds!